The Twin Adjustable Saddle Stool from Kanewell offers users a comfortable split-saddle seat with the added benefit of width and angle adjustment for a personalized fit. 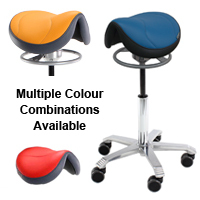 The Twin Adjustable Saddle Stool is well-suited for use in active office environments, at raised counters or elevated workstations, or anywhere the user needs to be able to move into close proximity to the working area--such as dental, medical, or veterinary practices. The upright posture provided by the saddle-seating encourages better back posture, provides a much greater range of movement than that available from traditional seats, and enables virtually effortless movement about a workspace. The split-saddle is designed to reduce pressure points and improve airflow for a cooler and more comfortable experience, especially during longer periods of concentrated work. 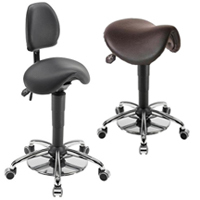 The Kanewell Twin Adjustable Saddle Stool has a slightly narrower profile than similar split saddles, a feature that might offer greater comfort to users with larger thighs. Another key difference is the degree of padding that makes the Kanewell Adjustable Twin Saddle Stool more forgiving for users whose body contours do not match the contours of the saddle foundation. The Adjustable Twin Saddle Stool from Kanewell features a thick layer of polyurethane foam which creates a firm but cushioned seating surface. Genuine top-grain leather provides a flexible and breathable surface and large diameter casters offer smooth movement throughout the workspace. Users who may need to clean or disinfect their seat may be interested in the Vinyl model. 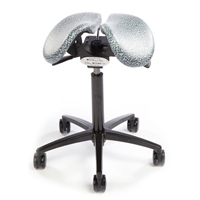 Optional accessories include the 360° Arm Accessory, an adjustable and repositionable Arm/Body/Elbow support that can be of value in any situation where the user is required to lean away from an upright position for any length of time, such as in a dental office. The Footring Accessory option can be used to provide stability and comfort support when the chair is elevated above standard heights (the height of the footring is adjustable independently of the height of the chair) and there are optional fixed glides to replace the casters if chair movement is undesirable. Le Twin Adjustable Saddle Stool de Kanewell offre les utilisateurs un siège selle confortablement divisés en deux parties avec avantage d`ajustement personnalisé de largeur et d`angle. 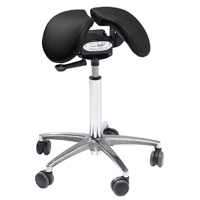 Le Twin Adjustable Saddle Stool est idéal pour l`usage dans les environnements de bureau dans lequel être actif est désiré, aux comptoirs ou postes de travail soulevés, ou n`importe où que l`utilisateur peut bouger en proche proximiter de l`espace de travail--comme dentiste, médicaux, ou vétérinaire. Le posture vertical offert par le siège selle encourage la posture positive, et offre une gamme de mouvements plus grande que les sièges traditionelles, et permet le mouvement sans éffort dans l`espace de travail. Le siège selle divisés en deux parties est conçu pour éliminer les points de pressions et améliore l`écoulement pour une expérience plus confortable et plus fraîches, particulièrement durant des longues périodes de travail concentré. Le Kanewell Twin Adjustable Saddle Stool a un profil un peu étroit que autre sièges selle semblable, une charactéristique qui peut offrire un meilleur confort pour utilisateurs avec des plus grandes cuisses. 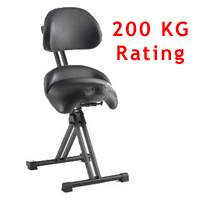 Une autre différence importante est le degrée de rembourrage qui fait le Kanewell Adjustable Twin Saddle Stool encore plus confortable pour les utilisateurs dont leur courbes de leurs corps ne correspond pas avec la fondation du siège selle. Le Adjustable Twin Saddle Stool de Kanewell est rembourrer avec une couche épaisse à la mousse de polyuréthanne qui crée une surface d`assis solide mais aussi coussiner. Fait de cuire véritable de haute qualiter de grain, il offre une surface respirante et flexible aussi qu`avec des roulettes à grande diamètre pour offrire le mouvement lisse à travers l`espace de travail. Les deux moitiés du siège sont ajustable pour la séparation et l`angle ébrasé, et le siège dans sont entier peut être incliner vers le bas si désirer. Trois modèles, chacun qui offre différente gamme d`hauteur, sont disponible pour permettre les utilisateurs de toutes tailles de faire sélection pour le propre hauteur pour une tâche spécifique. Les accessoires optionnelles sont un repose pieds en forme d`anneau (footring) qui peut offrire la stabiliter et le support confortable quand la chaise est élever (la hauteur du repose pieds en forme d`anneau-footring- est ajustable en hauteur indépendant de la chaise) et des patins solide pour replacer les roulettes. 11126 LOTAH Sit-stand Comfort Seat. The Salli Sway is a more economical model of the premium Salli Swing model, the most freely moving split saddle seat chair offered on the market today. The Sway differs only in that it has a lighter seat frame, standard (as compared to premium) components, a more limited warranty and fewer accessory and color options. The rocking mechanism enables the seat to freely and continuously tilt or 'rock' on the left-right and front-back axis (and all angles in combination) in response to the movements of the user without any adjustments to the chair. This stimulates muscles in the abdominal and pelvic area, realizing benefits for the user similar to those which can be obtained through use of an exercise ball. 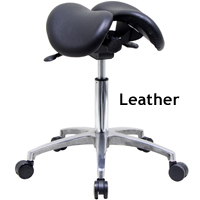 It also adds to the mobility and metabolism of the lower back while still getting appropriate support from the split saddle seat design and maintaining the natural curvature of the spine. The width of the two halves of the saddle seat are fixed and cannot adjust but the design accommodates the body types of most individuals. If an individual has very muscular or thick thighs, or minimal soft tissue (i.e. slight frame and below average weight), they may want to consider the Salli SwingFit. Height adjustment of the gas spring lift is accomplished through a standard hand-controlled height adjustment lever. Available lift sizes and the corresponding heights they accommodate are as follows: Short (4'0" to 5'2"), Mid (5'1" to 6'1") and Tall (5'8" to 6'5"). The 5-star base and lift are in an attractive chrome finish. The total weight of the chair is 10 kg (22 lb), the seat is 7.5 kg (16.5 lb) and is available in either black leather or black polyurethane (synthetic leather). 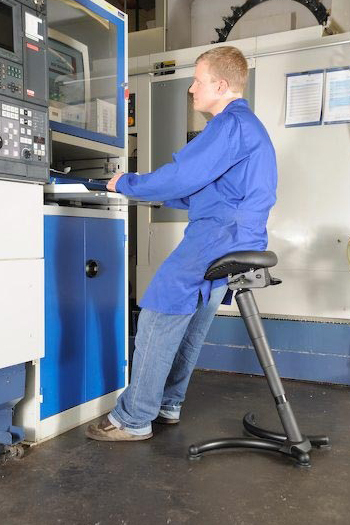 The EQUESTRY Sit-Stand Seat from Mey Chair Systems positions the user in an upright stance that is known to encourage upper body movement and deeper breathing. Together these have the potential to improve overall circulation and increase the alertness of the user. The upright stance also naturally realigns the spine and reduces the potential for lower back pain which is often associated with extended sitting. In addition it provides users with a noticeably extended reach or "Comfort Zone" which reduces the risk of over-reaching. The Sitting Saddle Stool comes equipped with casters which lock when weight is lowered onto them, meaning that the chair does not move once the user is seated. 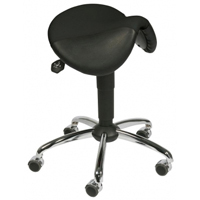 This makes this an ideal chair for those performing tasks which require fine control but a full range of movement. The full 360° of free rotation enables users to easily align to equipment or reach other work areas as needed. The gas lift provides a seat height anywhere between 22" to 27.6" and the seat also has the option of forward tilt up to 15°. This tilted seat position rotates the pelvis further forward, encouraging a more natural alignment of the back. Some users may also find this additional tilt more comfortable. Since the casters lock when weight is put on the chair, shorter users may be able to employ the tilting option in order to use this stool as a leaning solution when they need to move between locations and don't want to go into a fully seated stance. The EQUESTRY Sit-Stand Seat features easily cleaned black imitation leather upholstery and a chromium-plated steel base for durability. The HNDSFREE Sit-Stand Stool from Mey Chair Systems is ideal for use in sterile environments, especially those in which safety and security are important. The Foot Release Plate enables quick, easy, hands-free adjustment of the seat height from any point around the chair. In addition, the straddle position ensures that the feet are well-planted for exceptional stability and upper body control, providing users with superior upper torso mobility and range of motion. The full 360° of free rotation enables users to easily align to patients and equipment or to reach other work areas as needed. The seat can be tilted forward up to 15°, and the gas lift cylinder allows the height of the seat to be adjusted from 24.8" to 30.3". 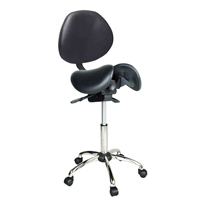 Note: Sitting on a Saddle Stool elevates a user higher than a standard seat. 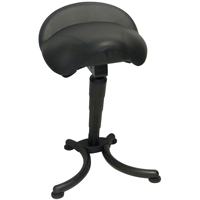 Saddle stools are therefore not generally recommended for use at a standard office desk. Please call one of our Product Specialists to discuss your intended use. We will be happy to assist you in selecting the best solution for your needs. 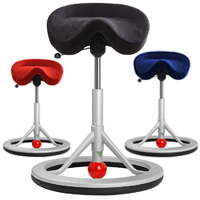 Equipped with special braking castors, the HNDSFREE Sit-Stand Stool rolls freely when the user is seated but stops moving as soon as the user stands up. This innovative feature enhances the overall safety of the work environment, and helps all present maintain their focus on the task at hand. Both models of the HNDSFREE Sit-Stand Stool feature easily cleaned Black Imitation Leather upholstery and a chromium-plated steel base for durability. 11305 HNDSFREE Sit-Stand Stool with Foot Release. 11209 HNDSFREE Sit-Stand Stool with Foot Release and Back.